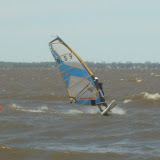 Twenty hearty sailors competed in big winds and choppy water on Lake Winnebago this weekend at the 2011 Walleye Wagatta. The temperature wasn’t very warm but the winds kept rolling in and the racing action heated up. Racers were tested with course racing on Saturday- the famous “M” course with upwind legs, multiple reaches and jibes, and a broad downind run to the leeward mark. 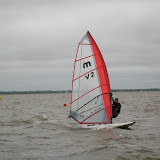 Winds varied from the lower teens to the mid-twenty mph range throughout the five racers that were completed. Race Five, the last of the day, was particularly challenging as a big gust rolled through during the top reaching leg. Only 15 year-old Magnus Zaunmueller was able to keep it together through that leg, giving him an early lead that he held on to all the way to the finish. Also impressive was a win for Ted Schweitzer in Race 2, sailing on an Original Windsurfer setup – especially since winds were 15-20 mph during the race. It’s one thing to get top notch speed out of a kit like that in a light breeze, but it takes incredible talent to stay competitive in stronger winds like this! Yet another example that it’s the sailor that makes the difference far more than the gear. The winds came in even stronger on Sunday with gusts over 30 mph and even larger swell. The temps were still cool, mid 50F at best, but the sun was a welcome sight after a cloudy Saturday. A Figure 8 slalom course was set to take advantage of the strong winds, and also give us the ability to run the start/inside jibe/finish line right off the beach and do Race Committee from shore. The wind was a bit lighter on the inside of the course at the start/finish line, but the wind on the outside was gusting over 30 mph. The key was to stay in control through the outside jibes, and Tim Cleary showed how to do it as he won both SlalomRace 1 and SlalomRace 2. Kevin Gratton used his homecourt advantage (he lives across the street from the race site) to win SlalomRace 3 and also SlalomRace 5. Magnus Zaunmueller again showed that he can keep up with the big boys by winning SlalomRace 4. The A fleet had a lot of competition at the top with four different sailors winning the five course races on Saturday, and three different sailors winning the five slalom races on Sunday. Only Magnus won both a course race and a slalom race (1 each). Adam Anderson won two course races Saturday and both Kevin Gratton and Tim Cleary won two slalom races each on Sunday. After all this racing, Magnus Zaunmueller had the consistency and top finishes to come away with the win. Congratulations to Magnus, I think this his first overall win at a MOWIND event. With the way he his sailing there will probably be many more to come. Kevin Gratton finished in second place overall (also 2nd in the 8.5 Limited class behind Magnus). Adam Anderson finished 3rd overall, Peter Hartwhich finished 4th, and Don Altmeyer 5th. Gatis Makstenieks finished 1st in Sport Fleet. I would like to thank Kevin Gratton at Windpower Windsurfing for the use of his equipment and facilities as well as his advice and effort in setting up this event. Thanks also to the rest of his team: Mary, Hook, Andy. A shout out also to “Low Boom” Larry Reed for helping on the committee boat, my family Wayne and Adam for helping throughout the weekend, and Del Carpenter for assisting with follow-up activities. He took pictures during Sunday’s racing and we will get those pictures onto the MOWIND Picasa album as soon as we can. Most of all, thanks to all of the racers that showed up despite the cold and forecasts of rain. I don’t think we got any rain the whole weekend of racing, but we did get wind. A lot of it. See you at the Dam Jam next weekend!